Grease and oil spills, especially on an already slippery floor surface, pose a slipping hazard. Cleaning up the spill immediately prevents it from spreading, but plain water won't cut through the oily residue. Combining an alkaline cleaner with an acidic one breaks down the oil and removes the slipperiness. Alkaline cleaners, like washing soda, alter oils into a soapy substance, but an acid such as vinegar is necessary to remove the soapy, oily residue before it hardens on the floor. Water and plain soap can't cut through oil on a floor. Combine 1 teaspoon of washing soda with 1 gallon of warm water in a mop bucket. Mop the floor with the soda water. Rinse and wring the mop regularly to remove the oil particles from the mop head. Some foaming may occur when the washing soda comes in contact with the oil. Empty the mop bucket and refill it with 1 gallon of fresh, warm water. Mix 1 cup of white vinegar into the mop water. Mop the floor with the vinegar water, rinsing and wringing the mop as necessary. The vinegar breaks down and removes any remaining oil or washing soda residue. Wipe the floor dry with a clean towel. Check for any remaining oily or slippery spots. Mop these spots a second time with the soda and vinegar. Washing soda and vinegar are suitable for linoleum, tile and wood flooring. Dry the floors immediately so water doesn't remain on the surface. 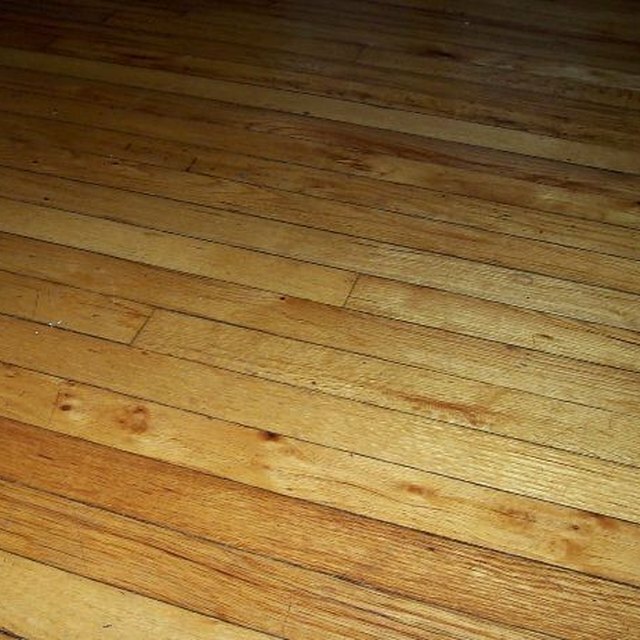 Standing water can warp wood and linoleum floors. Do not use alkaline cleaners or rubber tiles. Only use mild detergents formulated for cleaning these surfaces.